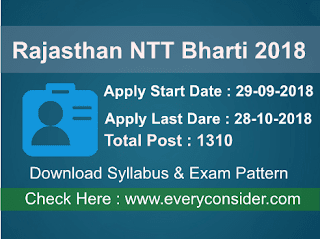 Rajasthan NTT Bharti 2018:- Rajasthan Rajasthan Subordinate and Ministerial Services Selection Board, Jaipur organized A Recruitment For Rajasthan NTT Bharti 2018. And Rajasthan NTT Vacancy Released for total 1310 Posts, (Non TSP - 1000 & TSP - 310). Rajasthan ntt bharti Notification update on official site 21 August 2018, started on 21 August 2018 & Closer date of online application 28 August 2018. This Vacancy Examination Name is Pre-Primary Teacher Direct Recruitment 2018. NTT Recruitment Organized by RSMSSB. 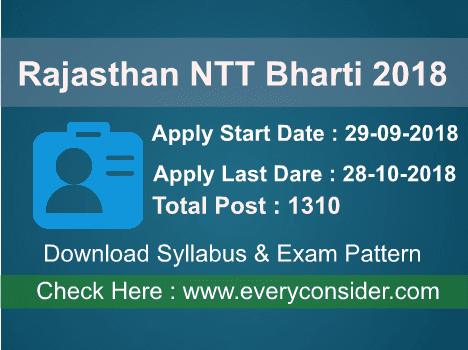 Interested & Eligible Candidate can Apply Ntt Bharti 2018. We are Provide here all details of NTT Vacancy, Rajasthan NTT Bharti in total 1310 Posts, In this Post Exam Mode may be Offline or Online. Apply Mode will be online, candidate after Fill-up Form can Pay Online Medium( by Using Credit Card, Debit Card, Emitra, Net-banking). Now we are Discuss about Fees, NTT Recruitment Application Fees For General Category 450 rupees, Obe Category 450 rupees, Non Creamy OBC Category 350 rupees, ST, ST, Female and PH category 250 rupees. Interested candidate can apply before last date, for online application form link we are provided below article. Applicant Education Qualification for Rajasthan NTT Bharti 2018, should be these given below list. Senior Secondary or Recognized Board from Secondary Education Board, Rajasthan, that qualifies its equivalent. Certificate of Examination in 2-year Nursery Teacher Test (NTT) from the institution recognized by the National Council of Teacher Education. Devanagari script was written in Hindi's practical knowledge and knowledge of Rajasthan's culture. पूर्व प्राथमिक शिक्षा अधियापक सीधी भर्ती परीक्षा 2018:- Rajasthan Subordinate and Ministerial Services Selection Board, Jaipur (राजस्थान अधीनस्थ एवं मंत्रालयिक सेवा चयन बोर्ड, जयपुर) declared Nursery Teacher Training Examination 2018 Examination Form For Pre-primary Education Teacher Direct Recruitment Started 29/09/2018 available on the official website. This Recruitment had released 2018. This NTT Vacancy Exam Held held on November to December Month. RSMSSB has declared Press Note for NTT vacancy 2018. RSMSSB be arly online portal started on submit online application form. Interested Candidates who applied online form for NTT 2018 they can apply from 29/09/2018 to 28/10/2018. They will be soon checked your Permission Letter on RSMSSB Official website. Candidates enter your detail like as Name, Application form Number, DOB & Mobile Number and other all required details fillup in online application form. After you pay required fees. Save and print your Application Form & Fee receipt hart copy. Exam Scheme: In Exam Question Paper will be Objective type Questions. Each Question paper will be 100 Marks. For NTT Exam Minimum Passing Marks 40 Marks Should be in Exam. Exam Paper held for 3 Hours. Rajasthan NTT Syllabus Now not update on RSMSSB Official website, if official website provide Syllabus then we are also update this website. then please wait for NTT Syllabus.